Time’s Up! Plus a Candidate 2 switcharoo! If you’ve been following the blog, you’ll know that my latest plan is to spend 2 weeks each on two separate candidate games before I really start trying to evaluate which game I need to focus on for IGF 2016. The 504 hours from June 1st > October 31st needs to have as little wiggle-room as possible. My current project is Project BR, a procedurally generated multiplayer survival deathmatch game. I started proper work on it over 3 weeks ago. The goal was to create a proof of concept, with all core mechanics in the game. 50% past my deadline and I’ve got the mechanics in, but it’s still not ready. After discussions with many friends and peers, I’ve realized that making a single-player demo of the concepts just isn’t going to do the idea justice. I will need that LAN network code at least, which I’ve been told is tricky to implement but not as scary as I assumed. There’s a point when I just have to say “enough is enough” and start moving on to another project. I’m cheating at the moment! Therefore, Project BR‘s first phase of development; iteration 1, is now officially complete. Most of the last phase of Project BR, the naughty extra week (! ), was implementing more of the ‘demo’ features. 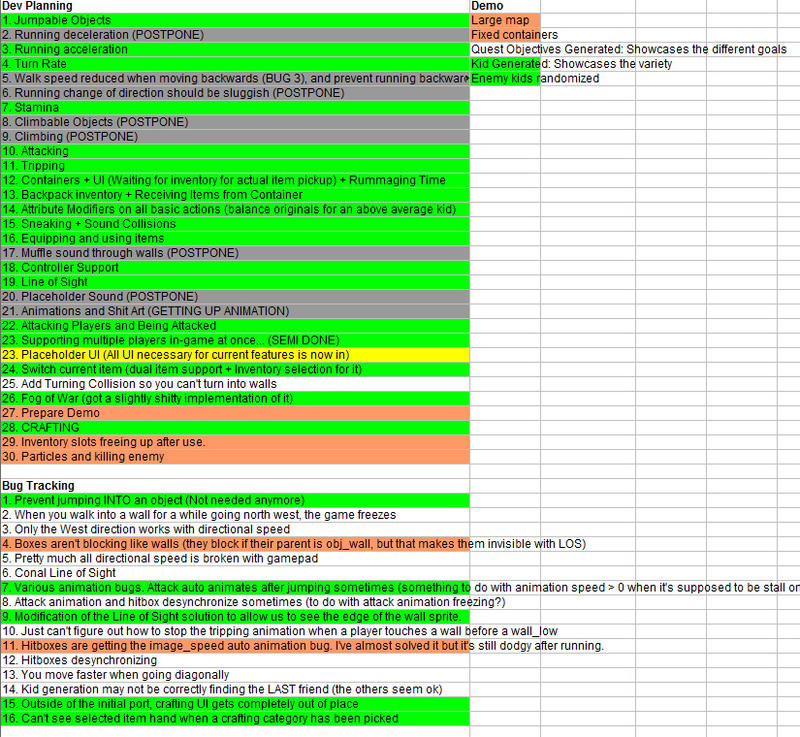 These are the features I felt the game must have to stand out and show its true colours. This is the coolest thing in the game. This is the reason why I want to do this project. Every character you play in Project BR is generated based on psychological traits, social relationships with other combatants, and a healthy dose of RNG. These numbers all feed into a large system that determines everything about your character. How fast they run, how quietly they walk, how far they can see, if and when they recognize traps, what and how successfully can they craft items. This is all in now, and it’s brilliant! Every kid is unique. The first is that the Line of Sight system, which is so crucial to the exploration and tone of the game, is currently broken when the map scales to a more realistic size. I have ideas for how to fix it, but this will take time. The second is that if Network Multiplayer is truly just a 1-2 day job… it’s better for me to actually build it and do a real test, than to work on this shoddy and inaccurate single player demo experience. This is another week’s worth of work at least, and I’m already 1 week over my time limit. So I’m putting it on hold. Iteration 2 is when I’ll add networked multiplayer and iron out the bugs. Until around mid-May, I won’t work on Project BR anymore. It’s time to start on Candidate 2. Candidate 2: Post-Apocalyp—- NO! Puzzle Game! It gives me a little sadness to announce that my Post-Apocalyptic 4X candidate is going to be pushed back. Project BR was a tough process and I’m a little burnt out with learning really new solutions. I need a quick win and the puzzle game I’ve got on my list of candidates is exactly that. I’ve even built it before in the past! Look at that! It’s TINY! 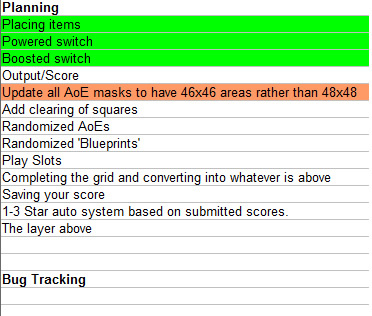 Unlike Project BR, when I finish all of these tasks… the game is basically in Alpha. It’s ready. It can be evaluated and played 99% like it would be in a real product. This is the sort of scope I should be aiming for anyway, so it’s a no brainer to do this project for the next 2 weeks. Unfortunately from a blogging perspective, things will be a little dry. I’m very well aware of the limitations of casual puzzle games; see the Threes/2048 fiasco. Although it’s a great problem to have, being so successful that everyone clones your game, I don’t want to tempt fate. I want to be in the best possible position in case that best/worst-case scenario happens. Therefore, I’ll need to be a little smarter with showcasing my work online. I’m hoping that I can keep things interesting here by doing a Ludum Dare post-mortem, which will update you on another potential IGF candidate game.